Most of my digital activities are centered around Dropbox. I can access my documents from everywhere, share files with my friends and co-workers, quickly send somebody a screenshot and backup all the pictures from my Nexus 5 automatically. Long story short – it’s one of the best pieces of software out there. However, most people only have 2GB of free Dropbox space, which is definitively not enough if you want to backup more than just a few documents and pictures. Luckily enough, there are some quick ways to increase the amount of free Dropbox space in just under 5 minutes. And there you have it. 2GB of extra free Dropbox space. But you can get a lot more. If you share your unique link (that you can get here) with your friends, you will get an extra 500MB for each friend that signs up and installs Dropbox. You can get 16GB of space by inviting 32 people. So share it on Facebook, Twitter and install Dropbox on all your family members’ computers. You could also set up a fake Facebook account with the Dropbox logo as the profile picture, connect it with Tinder and put your link in your description *wink wink*. A while back Dropbox was giving away 5GB of free space for all those who tried a beta version of the camera upload feature. If you didn’t get the 5GB back then, now you can do the same by installing Carousel for iOS or Android and enable “Camera Upload” to automatically backup your pictures. This would give you an additional 5GB. Earlier last year Dropbox has acquired the mobile startup Mailbox, a really simple and easy-to-use email application. To get your free Gig of Dropbox space simply install the Mailbox app for iOS or Android, link your Dropbox account with the app and wait for the magic to happen. To make it clear, you don’t really need to use the app. After receiving the extra space you can go on and uninstall the app if you want to. A while back Dropbox partnered-up with Samsung and HTC for cross-promotion. So, if you own Samsung and/or HTC devices, there’s a chance that you are eligible for the Samsung promotion or the HTC promotion (click on the links to see if your device is eligible). Long story short, to be eligible for this promotions your device must have come with a pre-installed version of Dropbox. To claim your free space simply complete at least five steps from the Get Started guide if you haven’t done it already. After doing this simply wait for an email saying how much free Dropbox space you’ve earned through this promotion. FYI, these techniques work only once per device and only once per account. So you need to be the first person to log into a Dropbox account on an eligible device, and you can only get it once. So, to all you guys with Samsung AND HTC devices – it won’t work twice. Once in a while Dropbox launches different challenges for Dropbox users. The ones I have participated in were Dropquest (a really tough one) and “Space Race” for universities. The latter, for instance, gave me an additional 15 gigs. Quite awesome. During his keynote at the German CeBit Lars Fjeldsoe-Nielsen, Dropbox’ former Head of Mobile, gave away 50GB of Dropbox space to all people who attended his presentation. This is the only case I know about, but I’m sure that other speakers will likely also give away some Dropbox goodies to the audience. 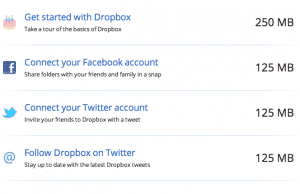 Dropbox also recently introduced its new premium plan – Dropbox Pro. Now, instead of having multiple price points with different storage volumes you have just one. With the new Dropbox Pro you will get 1TB (1024GB) of storage for just $9.99 per month. There’s no way on earth you will get so much space for free. So if you need it, buy it. Pro tip for European users: you might have probably seen that instead of paying $9.99 you will pay €9.99 (that’s $13.11). If you are planning on spending money on more Dropbox space, simply install the free ZenMate VPN extension and change your “location” to USA! This way you will save $37.44 a year, simply by buying the US plan. If you know any other ways to get more Dropbox space for free, please share then in the comments! During my time at college I have used Dropbox for all my team projects. Everything from creating project plans, editing short videos or presentations – everything was in my Dropbox. But since I was using “Selective Sync“, I didn’t see all the files I had in my Dropbox on my computer. For those of you who don’t know, Selective Sync allows you to select the folders you would like to sync to your computer, while leaving some just in the cloud. This comes in especially handy when it comes to automatic picture backups, archived files or if you have only a very small amount of storage on your computer (think low-end MacBook Air). So, I have recently discovered, that I still had some of my very old shared project folders in my Dropbox! Turns out, that they were more than 5GB in total! Since I didn’t need them at all anymore, I simply removed the folders that I owned from my Dropbox, and left shared folders owned by others. This way, I didn’t really increase my Dropbox space per se, but I still ended up with 5GB of additional space in just under 10 minutes. If you have been using Dropbox to collaborate on projects before, chances are that you are still subscribed to some shared folders, which you don’t need to be a part of anymore. In a recent interview (June 2015), Patrick Heim, Dropbox’s head of trust and security, disclosed that Dropbox might start giving away more Dropbox space for those users, who have made the additional effort to ensure their account is as secure as possible. That would make a lot of sense, since security is the number one challenge for the cloud storage provider. Whether this happens or not, it’s always a good idea to secure your Dropbox account. In either case, make sure to create a hard to crack password (with the help of 1Password or LastPass) and enable two-step verification for your Dropbox account. So, who knows… Maybe we will get an additional few gigs just by following best practices!